As a child, Shari Unger sensed that something forbidden was tucked away on the top shelf of her parents’ bedroom closet in Parsippany, New Jersey. For the first time, the album will be on public display Sunday, Holocaust Remembrance Day. The graphic images offer a glimpse into the bleak existence and atrocities at Dachau, where Arnold Unger, a Jew, was imprisoned at 15, after his family was killed. The public will be able to view “The Dachau Album” album at the Sheen Center for Thought & Culture on Bleecker Street in Manhattan. 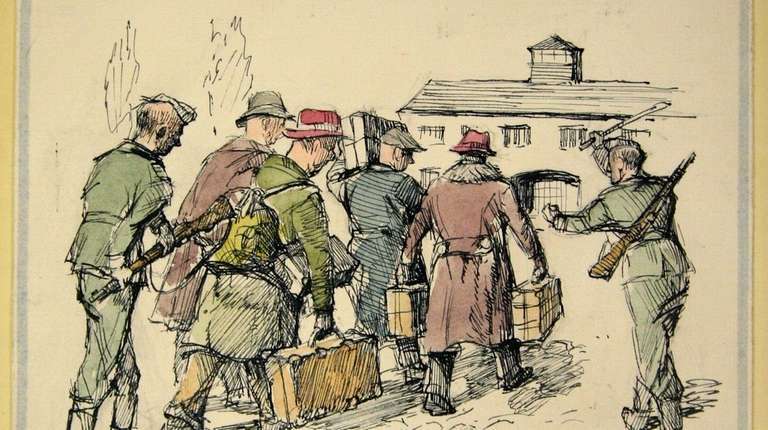 The drawings created by Polish artist and political prisoner Michal Porulski, a Catholic, show starving prisoners scavenging for food and being beaten by Nazi soldiers. In 2015, the contents of the album was blessed by Pope Francis after it was carefully researched for almost 10 years, said Shari Unger, who was 12 when her father died. She is one of four siblings left behind. Their mother died of cancer in 1974. For many years, Unger put the memory of the album in the recesses of her mind until she learned that a neighbor, Avi Hoffiman, actor and founder of the Yiddishkayt Initiative, was also the child of a Holocaust survivor. It is not known if Arnold Unger and Porulski knew each other. However, Shari Unger said strong evidence indicates the album with the inscription written in Polish — “To be a keepsake forever from times of difficulty and long captivity’’ — was given to her father by American officers who took the young boy under their wing as a beloved and trusted assistant after the liberation of the camp. Unger suspects the drawings were found and the album was put together for her father, who would later move to America to live with an uncle and his family. The album also illustrates Arnold Unger’s life after the war, including a photograph of him and a teenage sweetheart under a tree. He would go on to complete his education in electrical engineering and work on the team that designed the landing gear for NASA’s Apollo lunar module, his daughter said. “I didn’t know how extraordinary he was. His intellect and character. . . . He was a brilliant man who accomplished so much,’’ she said. “This 70-year-old album shows the same things that is happening today,’’ said Cole Matson, the center’s curator.